Abebe Bikila was a marathon runner from Ethiopia, winning dual Olympic gold medals: Rome in 1960 and Tokyo in 1964. He died in 1973 at the age of forty one from troubles after having a car accident. There’s a arena in Addis Ababa named after him. Google recognized him with one of Google’s doodles on which would have been his 81st birthday on 7 August 2013. Abebe was a last minute substitute in the Ethiopian squad for that Olympics. He had no athletic shoes to run in and Adidas, the official sponsor only had a few pairs left that didn’t fit him, and so he competed in the marathon without running shoes (he previously had been running without running shoes). He won the race in a time of 2hr 15min. 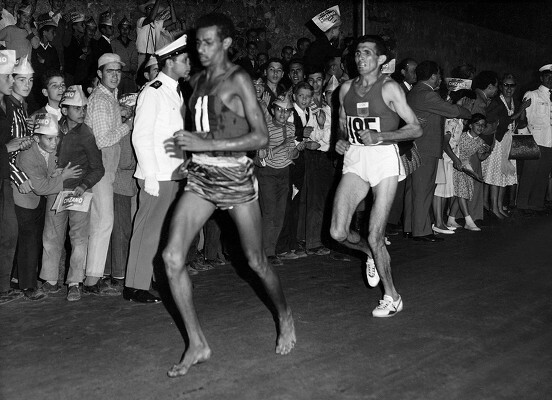 After the marathon, responding to an inquiry as to why he ran without shoes, Bikila answered: “I wanted the whole world to know that my country, Ethiopia, has always won with determination and heroism. Forty days before the Olympics he was operated on for an serious appendicitis and at one stage it was believed that he would probably struggle to take part. Abebe went on to win this marathon in a world record time of 2hr 12min, being the first runner to win two Olympic marathons. Bikila was using Puma athletic shoes in the race (which he also competed in to finish 5th in the 1963 Boston Marathon). Abebe is an easy to mild heel striker with some midfoot strikes as well. Despite that, he is not overstriding and did break a world record. Bikila is oftentimes held up by the barefoot running community as a idol for running the marathon without running shoes (as well as other elite athletes). Critics of that like to point out that he did compete faster and break a world record when using running shoes. As part of Abebe’s legacy, the minimal running shoe maker, Vibram FiveFingers have the Bikila model of their range branded after abebe. Early in 2015, the descendants of Abebe Bikila announced they were beginning a law suit against Vibram for registering the ‘Bikila’ name without authorization. This entry was posted in Running Shoes on October 20, 2015 by Admin.